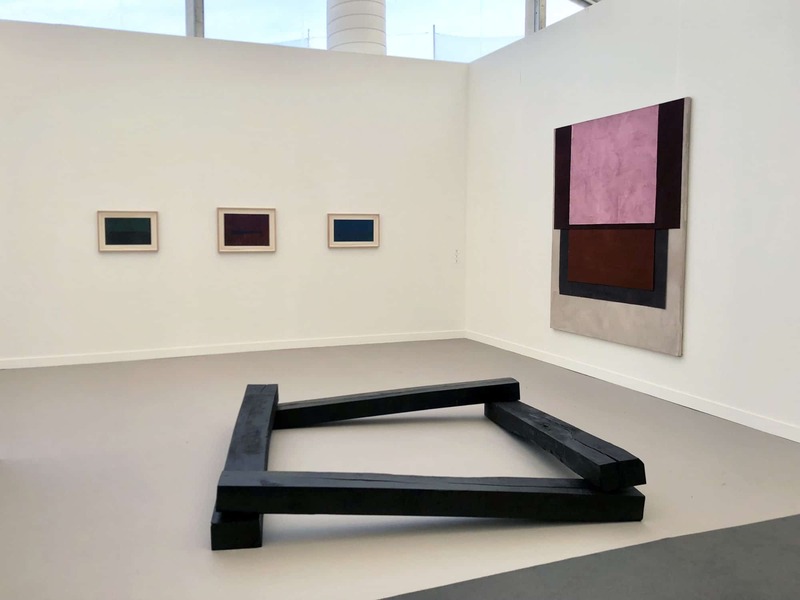 Recent highlights from our visit to New York for Frieze, TEFAF and gallery exhibits. Tanya Goel, “Simulcast”, 2018. At Nature Morte. Tanya Goel is interested in how to be a painter in a digital world. 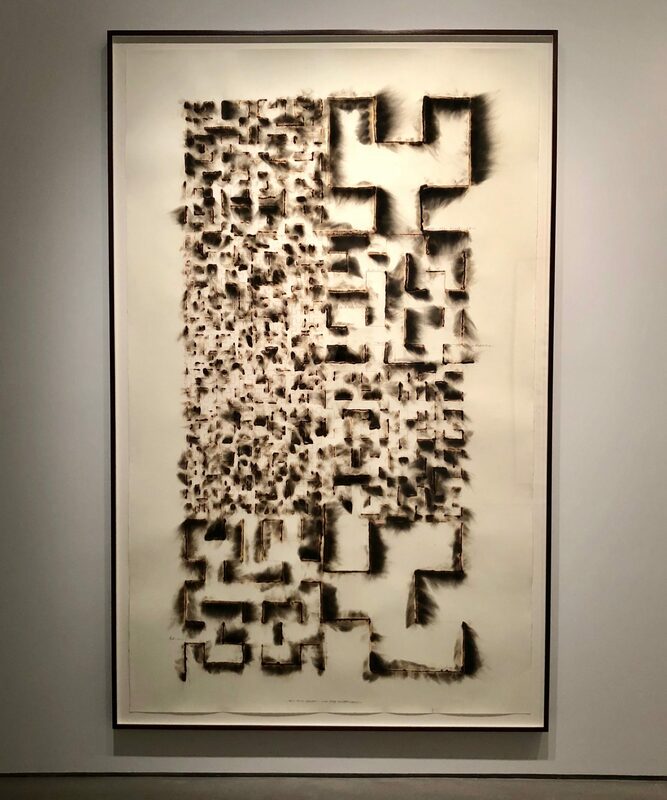 Goel elaborates on a dialogue for painting acknowledging the digital screens in which most of our information and images now reside, exploring both the limitations and the freedoms to be found within this flux. 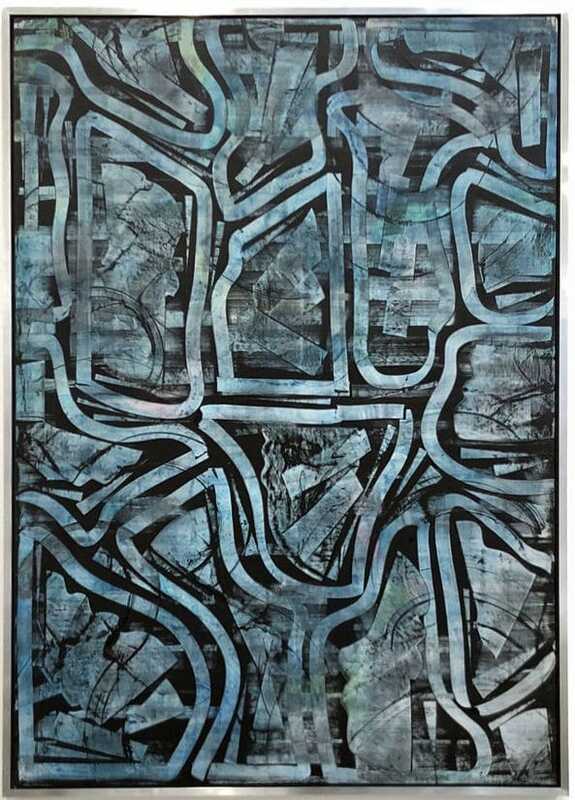 We love the energy of Tanya’s work…she literally draws from her urban environment – grinding tile, concrete, soil, etc. into pigments which are ultimately painted according to an algorithm in an exploration of light, color and form. Goel earned her MFA at Yale and was born and lives in Dehli. Her global perspective and the rigorous program at Yale result in really thoughtful and original work. Ann Agee, “Hand Warmers”, 2018. At P.P.O.W. Ann Agee’s installation in P.P.O.W. 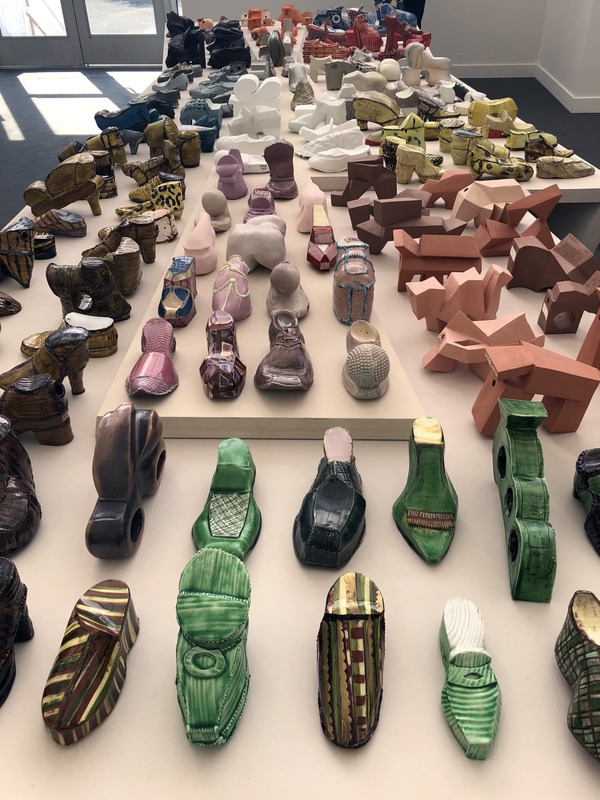 gallery ‘s booth is a chromatically organized display of ceramic shoes, some quite realistic and others abstract. She began this project, entitled Hand Warmers in 2016. Inspired by late 17th or early 18th century Italian folk pottery, hand warmers are a tool Italian women would fill with warm water to keep their hands warm. Agee’s practice focuses on replicating objects by hand, a process employed to simulate mass production while using the slowest method possible. Her work investigates domesticity, material culture, feminism, and personal history to create ceramic sculptures and mixed media installations that explore appropriation, mimicry, and reproduction. Carmen Argote, from the series “Arrangement Of Wares”, 2017. At Instituto de Vision. Carmen Argote explores notions of home and place. Interacting with architecture to reflect on personal histories and their own immigrant experience, Argote works with the places and materials that surround her, while utilizing local resources. 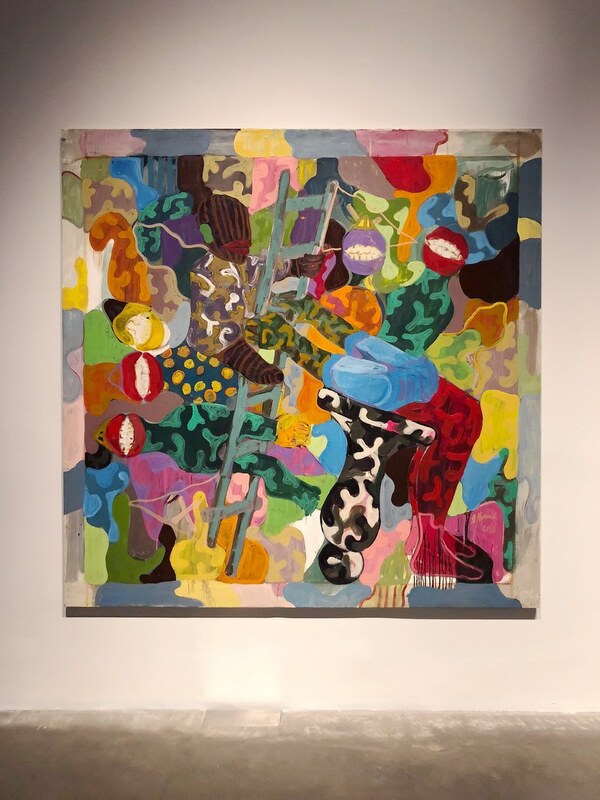 These works are created flat and are inspired by the compositions created by street vendors…suggesting that the organization of wares says something about the seller. In making these works, Argote uses potato prints in order to literally place the mark onto the canvas. When the composition is hung on the wall, it affords us a different understanding of a familiar composition elevated through the gesture of pointing to it as painting. Argote is included in the upcoming Made in LA show at the Hammer Museum. Eiji Uematsu, “Karuta”, 1986. At Gallery 38. In the Spotlight section of the fair, Gallery 38 featured the ceramic work of Eiji Uematsu. His work is not based on a theme but rather a feeling of touching the clay he has dug out of the soil and forging a link between the conscious and the unconscious. Uematsu’s approach is both primal and intuitive and transcends the existing frameworks and methodologies of contemporary ceramics. He embraces the natural cracking and warping and celebrates the rough textures of earth and gravel of the raw clay. When viewing this work, you get the impression that each work naturally emerged in the form in which it is exhibited. 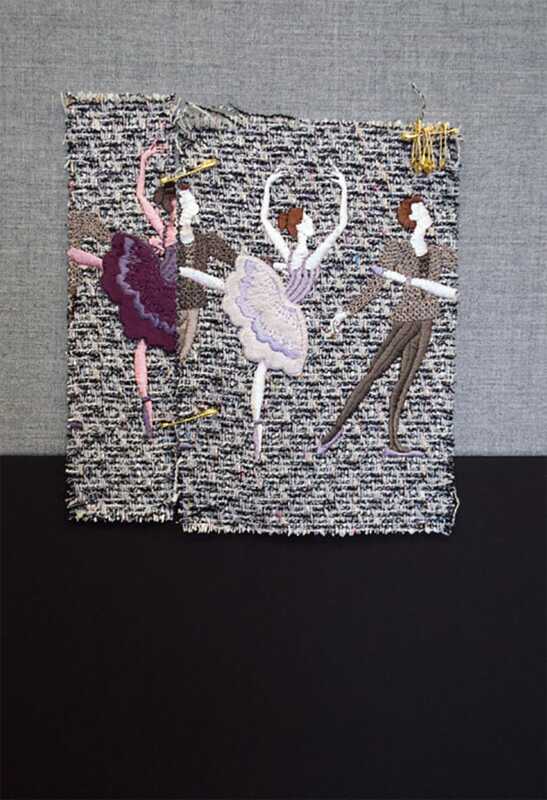 Tobias Kaspar, “Untitled (NFS29-Ballet Dancers in Purple, Pink and Gold on Gray Black Background)”, 2018. At VI, VII. Tobias Kaspar uses fashion and lifestyle items to reflect on the conflicted economy he is part of as an artist and consumer. Recurring methods in Kaspar’s work include the appropriation of a cosmetic consumer product. In these works, Kaspar is using hand woven couture fabrics that are samples for next season’s collections. 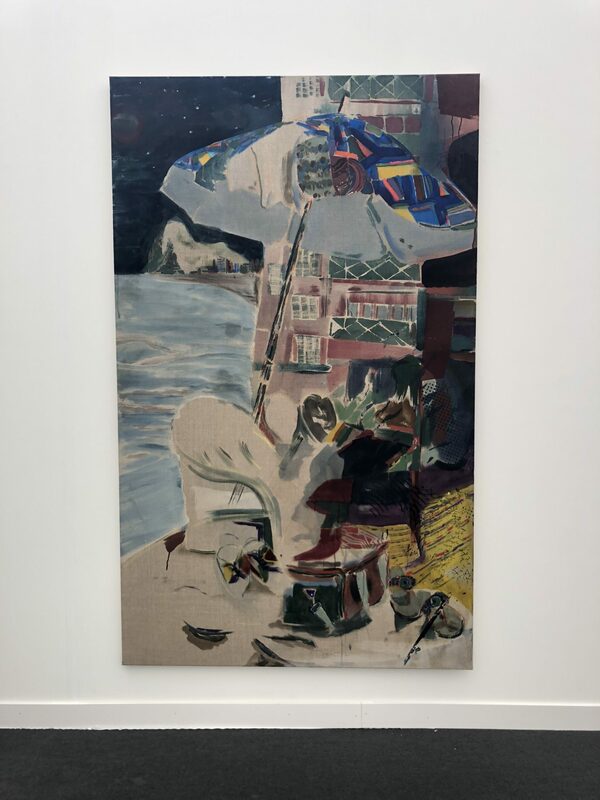 Kaspar’s interest in appropriating the marketing mechanisms of trendsetting lies not with an interest in the images produced, but rather in questioning the underlying strategies of seduction. 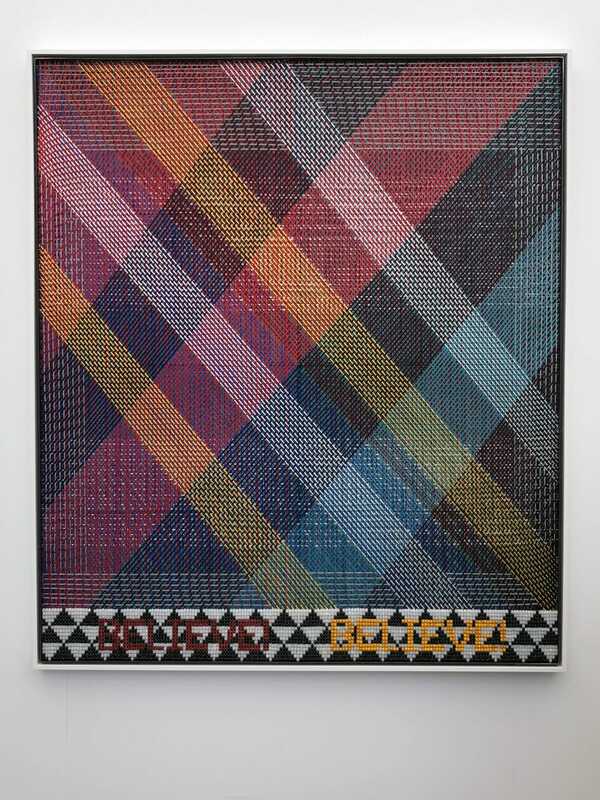 Jeffrey Gibson, “BELIEVE! BELIEVE!”, 2017. 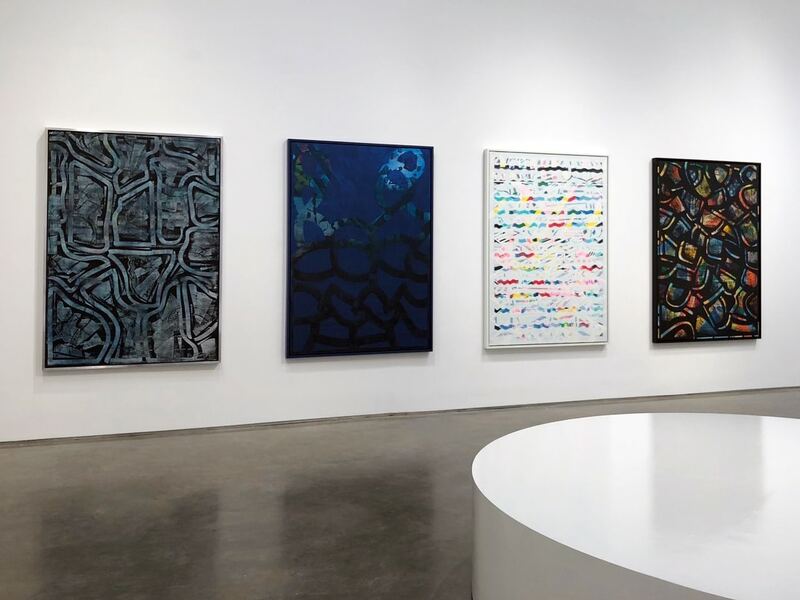 At Sikkema Jenkins & Co.
Jeffrey Gibson’s abstract sculptures, paintings, and prints carry an autobiographical cultural inflection. Gibson’s influences range from 19th-century Iroquois beadwork to contemporary street art. As a part Choctaw and part Cherokee artist, his practice is a reaction to a nostalgic and romantic vision of pre-colonized Native American life. (floor sculpture) Noboru Takayama, “Part of Underground Zoo”, 1969. 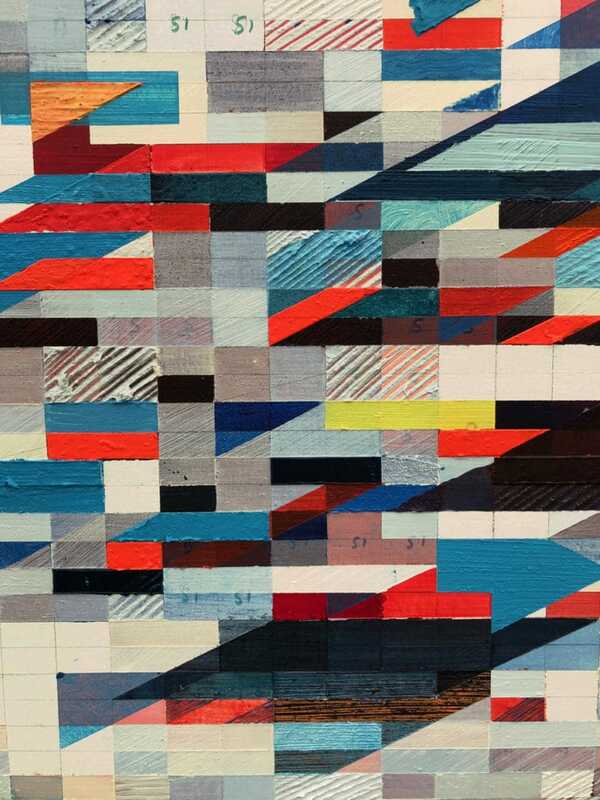 (on walls) Mary Obering paintings. At Kayne Griffin Corcoran. Kayne Griffin’s booth beautifully paired artists Noboru Takayama and Mary Obering. Noboru Takayama explores themes of memory, the body, and the tension between opposing forces. Raised in the physical destruction and political unrest of post-World War II Japan, he often relates these concepts to the perils of modernization. 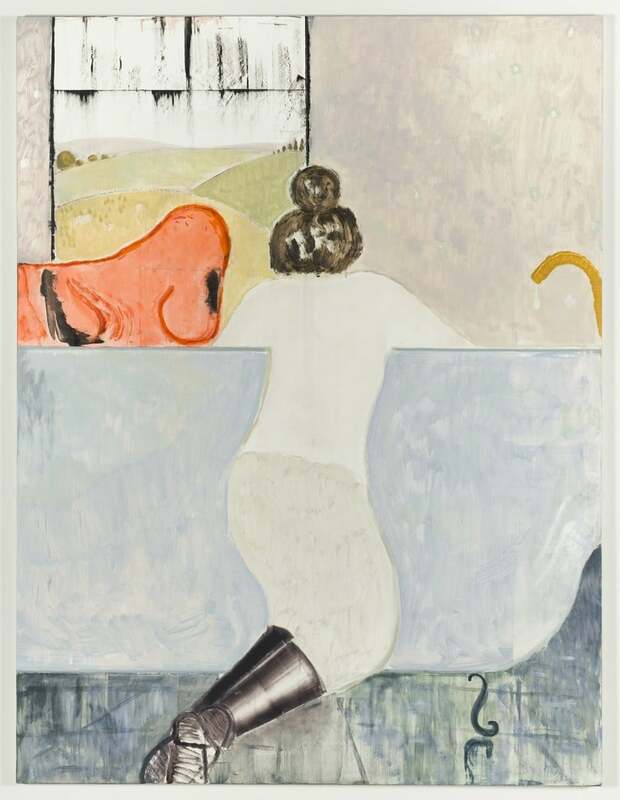 Mary Obering, “Déjà Vu”, 1975. At Kayne Griffin Corcoran. Mary Obering’s timeless works from the ’70s appear as fresh as if they were made today. Her language of contemporary abstraction with a sculptural point of view, is as relevant in todays contemporary art culture as it was in 1975. Obering identifies herself as a geometric art maker. In her earliest paintings she explored color and space by constructing fields of colored canvas, laying one piece on top of the other in vertical and horizontal orientations playing with ideas associated to color field and hard-edge painting. Nick Goss, “Home”, 2018. At Simon Preston Gallery. The psychology of place resounds throughout Nick Goss’s practice. The landscapes are faintly familiar and his interiors and cityscapes layer memory and history. Goss’ technique involves adding layers of raw canvas, delicate washes, oil paint and silkscreen. The distorted and incomplete compositions evoke a fragmented impression of the eclectic subjects of the work. 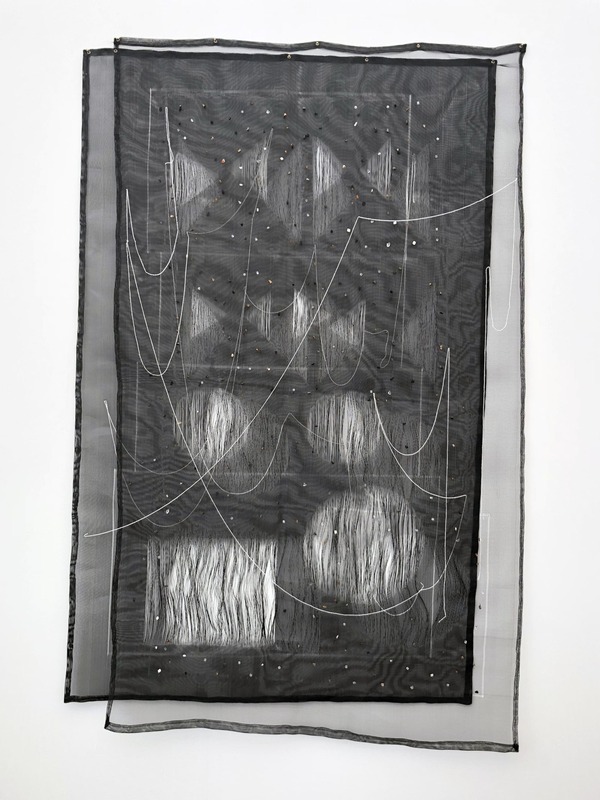 Vivian Caccuri, “Porta- malas preto”, 2018. At A Gentil Carioca. 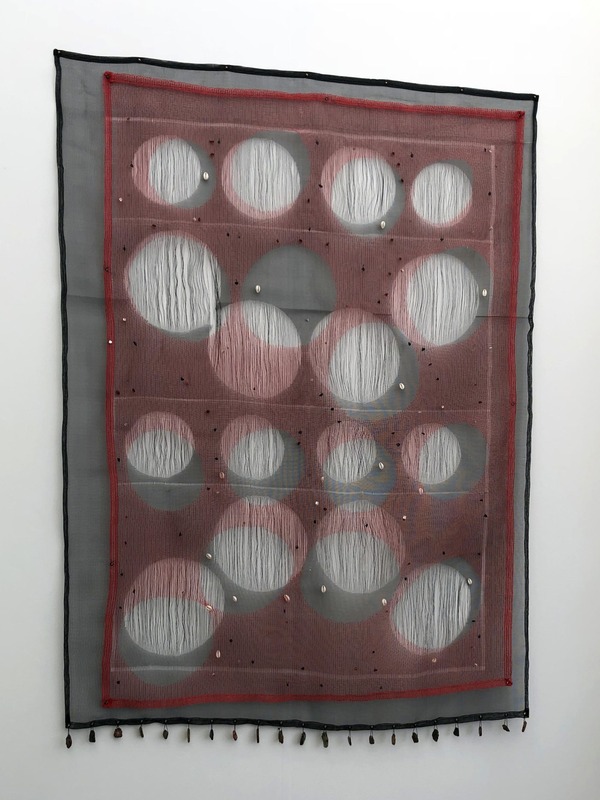 Vivian Caccuri, “Porta-malas vermelho”, 2018. At A Gentil Carioca. Through objects, installations, and performances, Vivian Caccuri’s work creates situations that disorient everyday experience and, by extension, disrupt meanings and narratives seemingly as ingrained as the cognitive structure itself. Most of her materials and forms are taken from areas of urban reconstruction in Rio de Janeiro, São Paulo, and rural areas of. Goiás, Midwest Brazil. The cut-out shapes reference stereo speakers and amplifiers and she often encourages interaction with her pieces by adding stones or shells to the bottom that chime when the piece is in motion. Sanya Kantarovsky, “Charlotte”, 2018. At Luhring Augustine. The dark humor consistent in Kantarovsky’s work, across a variety of mediums, pits the elegant against the abject and thrusts private space – be it physical or psychological – into public view. Evoking the feeling of an uneasy inner monologue, figures are gawked at, exposed, or poked. They interact with one another, as well as the edges of the canvas itself, testing the confines of their given bodies and their given frame. Similarly, Kantarovsky probes their art historical predecessors: both canonical and relatively unknown painters, writers and illustrators. The presence of these references simultaneously questions and indulges in a lineage of painterly impulses. Nori Pao, “Day Drawings [JUNE 2017]”, September 6, 2000- 2018. At Stellar Projects. Nori Pao’s work pushes the material boundaries of ceramics, examining broad themes of time, memory, identity, reality, order, and chaos. Her work draws from a very personal lens. Day Drawings is an ongoing project that Pao began as a way to visually record existence and time. Each daily drawing is inspired by a particular moment, memory, or method unique to the date it was created. Pao presents an excerpt from her calendar of “drawings” in the form of clay. 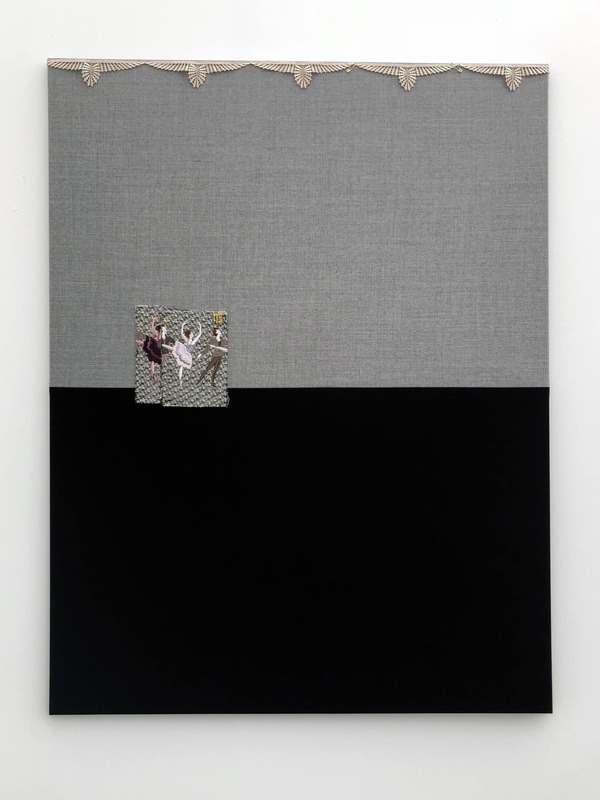 Erin Shirreff, video still of “Son” 2018. 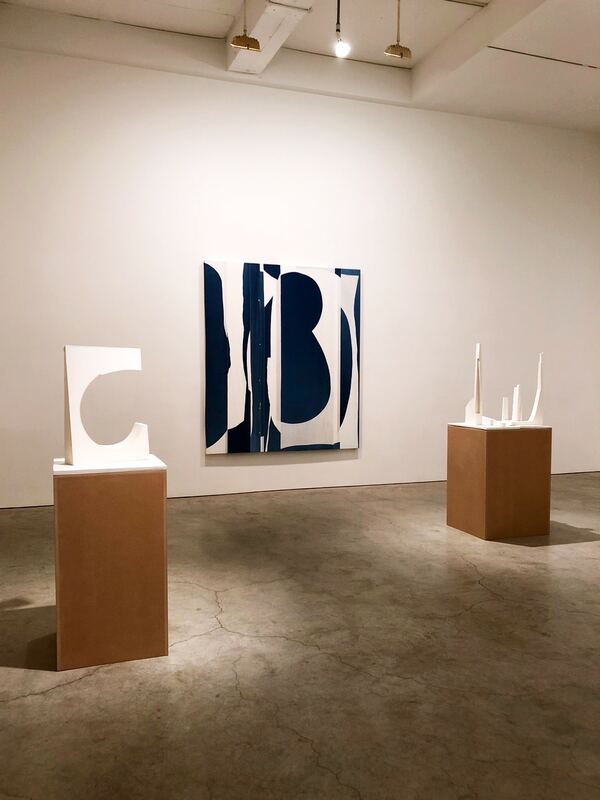 At Sikkema Jenkins & Co.
Erin Shirreff, installation view, 2018. 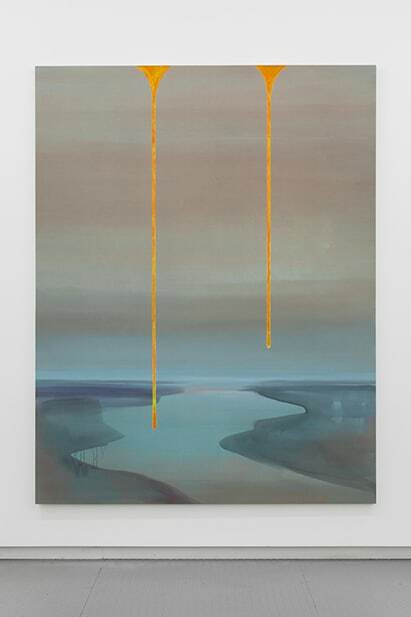 At Sikkema Jenkins & Co.
Erin Shirreff “Edge, Plane and Arc”, 2018. 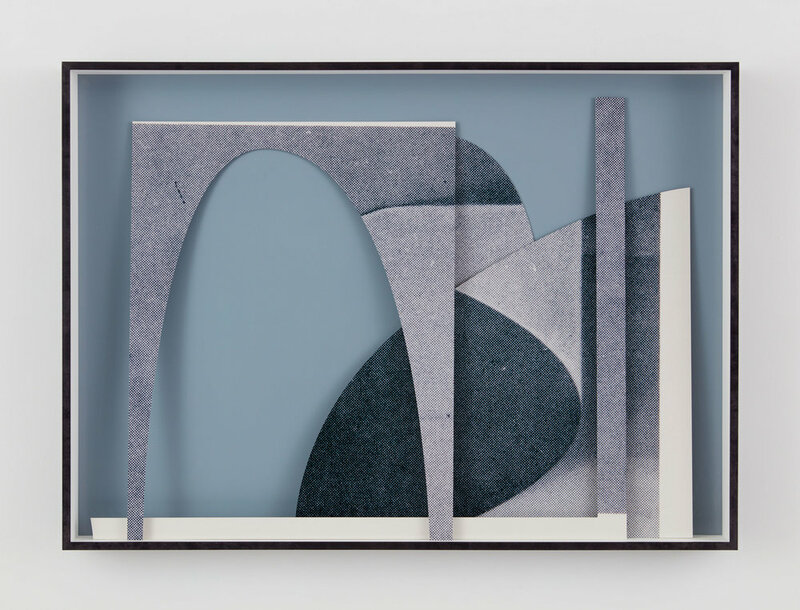 At Sikkema Jenkins & Co.
Erin Shirreff’s diverse body of work is united by her interest in the ways we experience three-dimensional forms in an age in which our perception is almost invariably mediated by still and moving images. 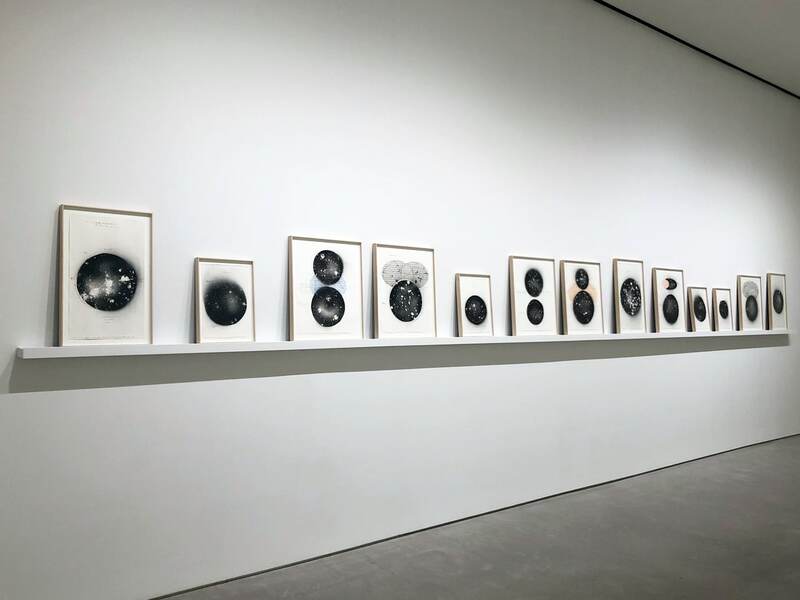 This exhibition includes a new video Son, rooted in the artists experience in the solar eclipse as well as a new series of wall-based works – enlarged scans of halftone book reproductions that are printed onto sheets of aluminum that are then cut into shapes and layered in informal compositions within deep-set frames. In the back gallery, there were three new large-scale cyanotype photograms that are assembled through collage. 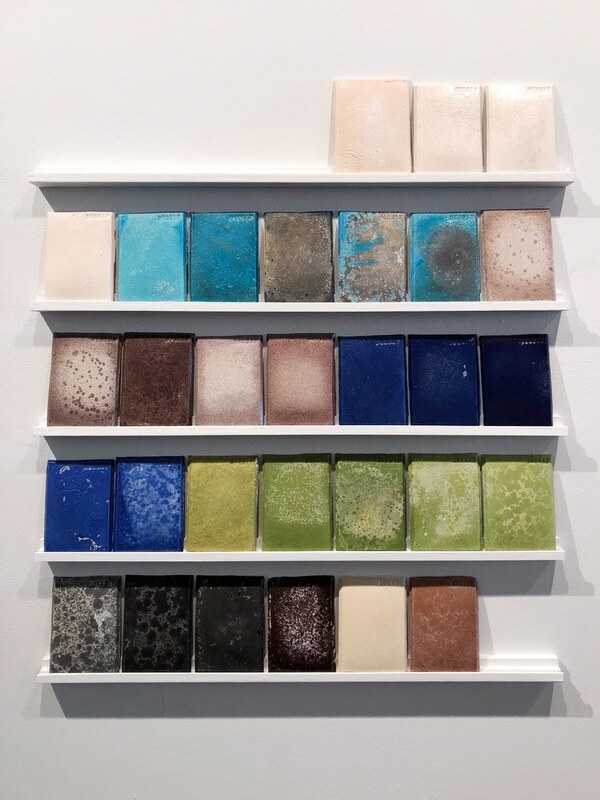 Wanda Koop, installation view, 2018. At Arsenal Contemporary. Wanda Koop, “Standing Withstanding”, 2018. At Arsenal Contemporary. 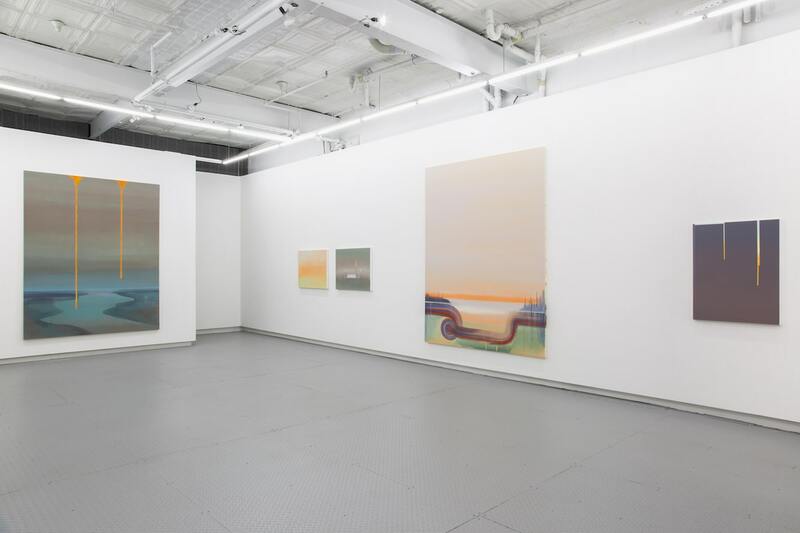 Through blooms of color and quivering fluorescents, Wanda Koop’s landscapes offer sightlines of the world, all the while underscoring how one’s view remains contingent on one’s position. 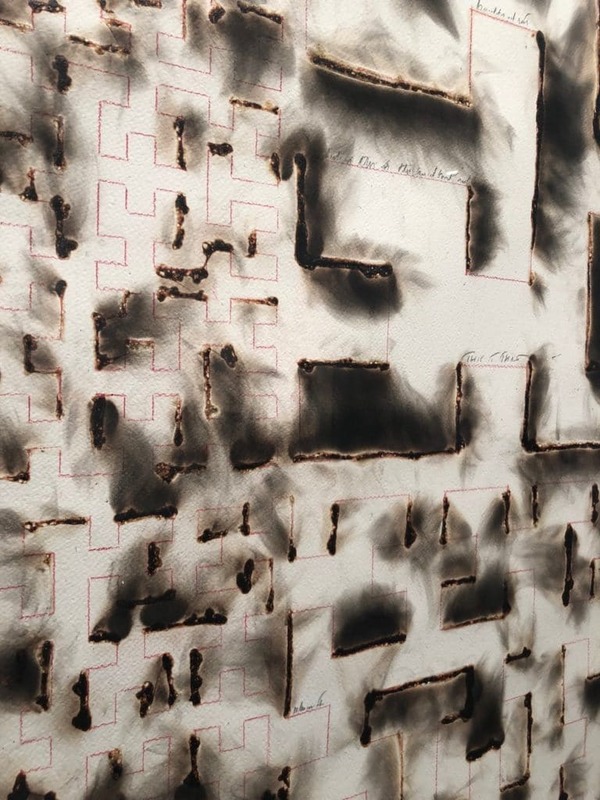 Her paintings look to the primordial sign of fire as it occurs through time, questioning the relationship to history that is expansive and non-static. Koop is interested in investigating the contemporary understanding of landscape as a vehicle for addressing cultural encroachment upon and destruction of the natural world. With a concentration on the interrelationship between nature and human perception, canvases capture the minimal silhouette of various skylines, abstracted through positive and negative space, as a softly optical re-visitation of these sites through the estrangement of memory. Jitish Kallat “Rain Study (the hour of the day of the month of the season)”, 2017. At Sperone Westwater. 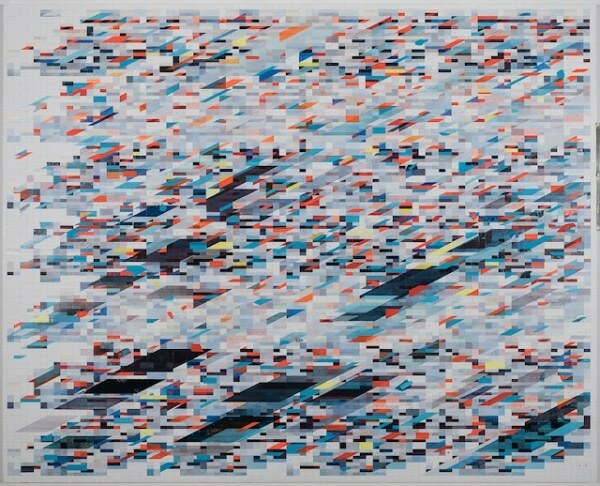 Jitish Kallat “Wind Study – Hilbert Curve”, 2017. At Sperone Wastewater. Detail of “Wind Study”, 2017. Jitish Kallat’s poetic work delves into ­ideas of time, sustenance, sleep, vision and perception along with a compelling interplay of scales and proximities, and evocations of the celestial and the cosmological. Kallat describes the Windy Study drawings as “transcripts derived by eavesdropping on the silent conversation between wind and fire”. 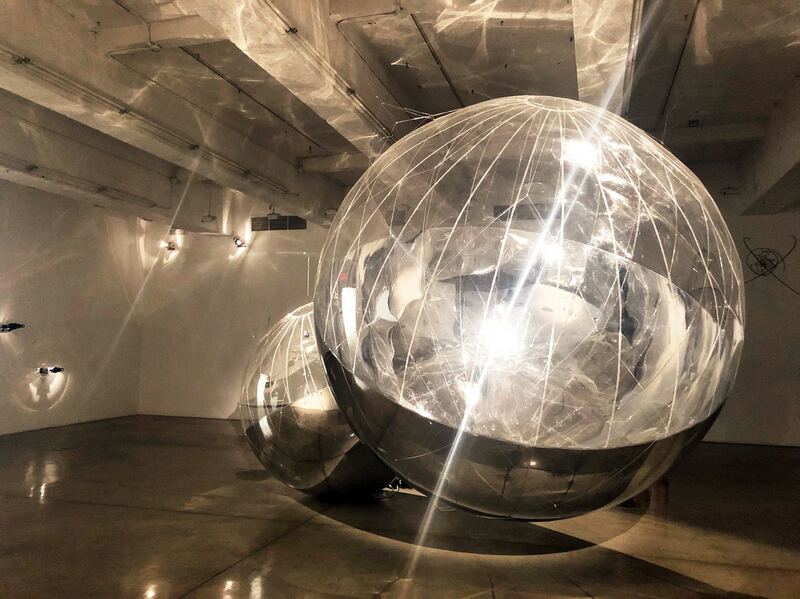 Tomas Saraceno, “Solar Rhythms”, 2018. At Tanya Bonakdar Gallery. 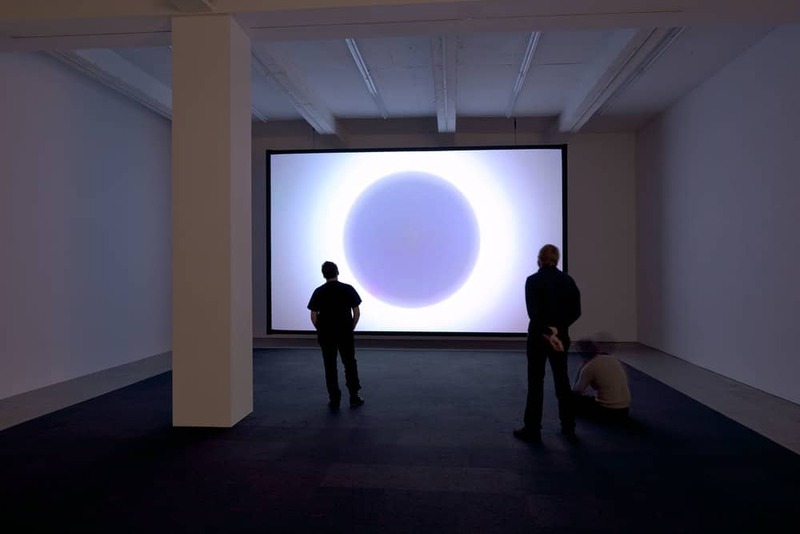 Tomas Saraceno’s exhibition, Solar Rhythms, suggests a model for a landscape that balances our relationship with, and harnesses the unlimited potential of, the Sun. This realization requires a thermodynamic leap of imagination, just like during an eclipse, when only in the absence of light do we become aware of our scale in the shadow of the cosmos. In that moment of alignment between Sun, Moon and Earth, we understand that we rely on a reciprocal alliance between the elements and effects, the shifting winds, the exchange of heat and momentum, and the diffusing reflection of solar radiation towards the cosmic extent. 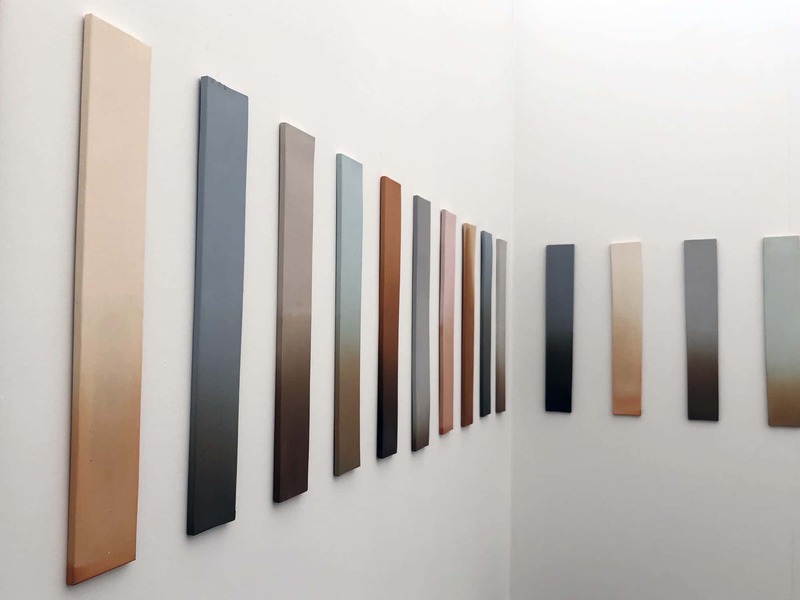 Julia Dault, installation view, 2018. At Marianne Boesky Gallery. Julia Dault, “Stone Cold Fox”, 2018. At Marianne Boesky Gallery. 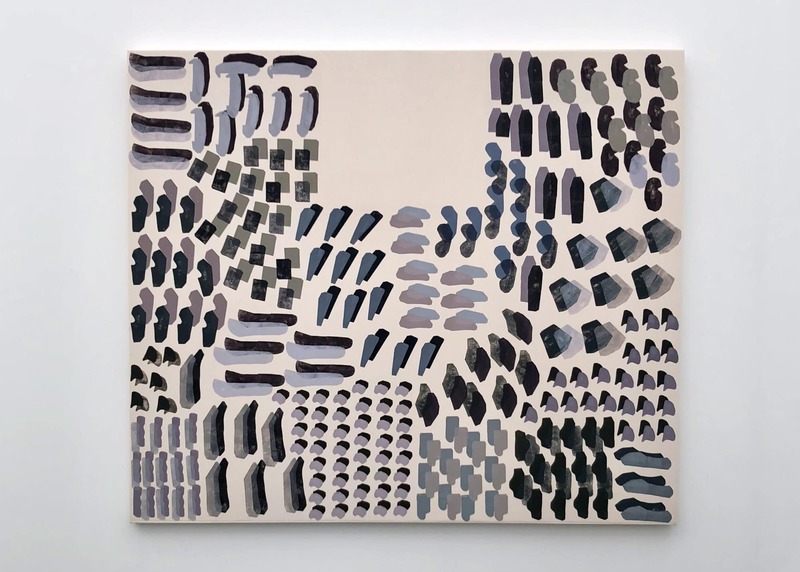 Julia Dault’s work underscores the value of engaging with the intricate, often beautiful, and little-considered systems that lie just beyond any given surface. Her work is an iterative play with color, form, texture, and materials and is an exploration of the creative potential of industrial products. Gresham Tapiwa Nyaude, “If you want to help us you need to understand, Part 2”, 2018. At the New Museum. Zimbabwean artist, Gresham Tapiwa Nyaude uses surreal imagery and camouflage patterning to veil the content of his provocative work. Having lived under the rule of the former African strongman for most of his life, he produces visual interpretations of old tribal proverbs to address contemporary concerns. In his vibrant and psychologically charged paintings, Nyaude mimics the graffiti that camouflages the streets of his homeland. The work brilliantly references the bright and dynamic patterns of African textiles.